The Minister claims a need for this dump is generated by civilian radioisotope production & not from military use – therefore it cannot be legitimised under auspices of the S.51(vi) Defence umbrella. there is no legal base for the Commonwealth to enforce State acceptance of radioactive waste. The 2015-16 $10+ million South Australian Nuclear Fuel Cycle Royal Commission found that: “The construction or operation of a facility for storage and disposal of nuclear waste, along with the importation or transport of nuclear waste, is unlawful in South Australia”. The amendment or repeal of the Nuclear Waste Storage Facility (Prohibition) Act 2000 (SA) would therefore be required prior to any substantive progress being made in further developing any proposal. “ 1 The Nuclear Waste Storage Facility (Prohibition) Act 2000 (SA)2 must be amended or repealed PRIOR TO ANY SUBSTANTIVE PROGRESS towards developing a radioactive waste facility in this State. 2. The newly elected Liberal Premier Steven Marshall has previously categorically stated: “A Marshall Liberal Government will not support the building of a nuclear waste repository in South Australia.“ 4 : & in answer to a February 2018 Election Survey the South Australian Liberal Party responded: “The Liberal Party supports the current Nuclear Waste Storage Facility (Prohibition) Act 2000“ 5 . 4. To date (June 2018) the NRWMF-T has expended $40+ million of taxpayers PUBLIC MONEY towards: not only encouraging ‘local communities’ acceptance for a nuclear waste storage facility within South Australia; but also financing active on-site preliminary works deemed essential to constructing said facility. Clearly & brazenly contrary to State Law. 5. It would appear that the NRWMF-T has failed to investigate nor even consider any implications arising from the current prime facie unlawful nature of their actions. Numerous sham ‘community consultation’ medleys; Taskforce presence in the field, & radiopharma promotions. Myriad ANSTO propaganda tours of Lucas Heights; French des visiteurs; community grants; ORIMA & AECOM contracts, & etc.. costing tens of millions. All done without first establishing any legal foundation. Amongst other dubious claims, Minister Canavan would have us believe that Federal Legislation allows him to run roughshod over State Law. But does the Emperor actually wear any clothes? 7. The previous South Australian Premier Jay Weatherill in 30 January 2018: “ Asked if the state government would pursue a High Court case against the Turnbull government if a national facility were approved in South Australia, Mr Weatherill said: “We would have to explore our options to see what steps can be taken.” “ 7 . 8. One of those steps would be to query whether Federal Parliament had Constitutional Authority to impose radioactive waste upon a State which had specific laws prohibiting such. Section 51 of the Australian Constitution describes the various Powers of the Federal Parliament, & there are 39 such capacities – none of which relate to things radioactive8 : whilst Section 118 obligates the Commonwealth to recognise & respect the public Acts of the States. To make things perfectly clear, included as Appendix 1 is the whole Section 51 of the Australian Constitution: we challenge anyone to demonstrate how Canberra can legally impose Commonwealth owned radioactive waste upon any State whose Legislation prohibits such – S.51. (xxvi) actually says that Federal Parliament needs to respect State Legislation. Prime facie there is no legal base for the Commonwealth to enforce State acceptance of radioactive waste. 10. The knowledge that the Feds don’t have Constitutional Power to dump radioactive waste upon the States is not rocket science & is not a new revelation. In fact back in the 1950s, when the expansion of the nuclear fission enterprise was seen as rapidly developing technology which Australia should embrace; Canberra took steps toward Constitutional change.
. 15. Hence the deficit of Commonwealth Power regarding civil & industrial radioactive waste facilities continues to this day. The Minister claims a need for this dump is generated by civilian radioisotope production & not from military use – therefore it cannot be legitimised under auspices of the S.51(vi) Defence umbrella. 18. However the Australian Constitution S.52(1) only allows Federal authority “…. over places acquired by the Commonwealth for public purposes “ – voluntarily nominated sites are by definition un-acquired.So any & all actions instigated by the Commonwealth upon the voluntarily nominated sites prior to acquisition are rendered unlawful. 19. Whilst also, as previously explained, the Australian Constitution S.51(xxv) AND S.118 both prohibit the Federal parliament from over-riding State Law. If the Commonwealth does not have Constitutional Power to over-ride State Laws & foist radioactive waste upon such; then likewise S.51(xxxi) denies lawful ability to acquire property in order to establish any site facilities. 4 Marshall, S., 15th September 2016 “Nuclear Industry- Our Position” https://www.stevenmarshall.com.au/tags/infrastructure_policy? page=2 NB original whole text has been taken off-line since the 2018 State Election & Marshall now appears to be pro-dump. xxxix matters incidental to the execution of any power vested by this Constitution in the Parliament or in either House thereof, or in the Government of the Commonwealth, or in the Federal Judicature, or in any department or officer of the Commonwealth. An American Spy Base Hidden in Australia’s Outback, NYT By JACKIE DENT NOV. 23, 2017 The trials — and the Australian government’s uncompromising prosecution of the protesters — has put a spotlight on a facility that the United States would prefer remain in the shadows. — Margaret Pestorius arrived at court last week in her wedding dress, a bright orange-and-cream creation painted with doves, peace signs and suns with faces. “It’s the colors of Easter, so I always think of it as being a resurrection dress,” said Ms. Pestorius, a 53-year-old antiwar activist and devout Catholic, who on Friday was convicted of trespassing at a top-secret military base operated by the United States and hidden in the Australian outback. From the base, known as the Joint Defense Facility Pine Gap, the United States controls satellites that gather information used to pinpoint airstrikes around the world and target nuclear weapons, among other military and intelligence tasks, according to experts and leaked National Security Agency documents. As a result, the facility, dotted with satellite dishes and isolated in the desert, has become a magnet for Australian antiwar protesters. ….Over the past two weeks, Ms. Pestorius and five other Christian demonstrators were convicted in two separate trials of breaching the site’s security perimeter last year. They could face seven years in prison……..
Born at the height of the Cold War, Pine Gap was presented to the Australian public in 1966 as a space research facility. But behind the scenes, the station was run by the C.I.A. to collect information from American spy satellites about the Soviet Union’s missile program……Photos taken from the air show a sprawling campus punctuated by white geodesic domes that look like giant golf balls. Inside these spheres, called radomes, are antenna systems that send and receive information from satellites in constant orbit above the earth…..Today, more than 800 people from both countries are believed to work at the base. But the United States is firmly in control. “Pine Gap has changed and developed enormously,” said Richard Tanter, a senior research associate at the Nautilus Institute and honorary Melbourne University professor who has investigated and criticized the base for years. In documents leaked by Edward Snowden, the American intelligence contractor turned whistle-blower, Pine Gap is described as playing “a significant role in supporting both intelligence activities and military operations What that actually means, Professor Tanter said, is that the station is involved in real-time contributions to the United States’ global military operations in Afghanistan, Iraq and Syria. Professor Tanter has gleaned information about the secret site from unexpected public records, including the LinkedIn profiles of Pine Gap contractors and satellite photos that reveal new construction at the site. Professor Tanter, who is president of the Australian board of the International Campaign for the Abolition of Nuclear Weapons, said he wanted the government to “make a very clearheaded assessment” of whether it is in Australia’s best interest to contribute data for drone assassinations and targeting nuclear weapons..”….. Last year, in the early hours of a cold, dark September morning, Ms. Pestorius, Mr. Dowling and three other “peace pilgrims,” as they call themselves, breached Pine Gap’s security perimeter. As the activists scrambled up a rocky hill to get closer to the base, and with the police moving in, Ms. Pestorius picked up her viola. Another protester strummed his guitar. As they played a lament for those killed in war, Mr. Dowling held up a large, laminated photograph showing a bloodied young woman with her foot missing. A sixth activist, Paul Christie, 44, carried out his own protest at Pine Gap days later; he was tried separately and convicted last week, charged, like the others, with entering a prohibited area. During the activists’ back-to-back trials this month, a modest band of supporters gathered at the courthouse. Many were members of the country’s antiwar movement, parts of which are religion-infused. A Quaker knitted flower brooches. A Buddhist brewed coffee from the back of his van. A collection of colorful banners tied to fences read “Close Pine Gap” and “End the U.S. Alliance and Pine Gap Terror Base.” Mr. Dowling, who said he had been arrested between 50 and 100 times, was found guilty once before of trespassing at Pine Gap, in 2005. The conviction was later overturned. One of his co-defendants this time was his 20-year-old son Franz, the guitar player at the protest last year. The younger Mr. Dowling and two other defendants — Andrew Paine, 31, and Timothy Webb, 23 — live together in a Dorothy Day Catholic Worker House in Brisbane, where they regularly take in homeless people. All five were found guilty of entering a prohibited area, and Mr. Paine was convicted of an additional charge of possessing a photographic device. During their trial, the five — who acted as their own attorneys — tried to argue that they had acted in the defense of others, but Justice John Reeves did not allow it. random search for relevant information which was also confined by the time available to process and present these findings. These are offered at this time as an additional body of information that may help fill some of the gaps in the thrust to force further nuclear energy production and waste disposal on the people of S. A.
Amongst the many recommendations of the Nuclear Fuel Cycle Royal Commission there were 3 major points which raise concerns regarding the possible imminent changes to Legislation in S.A. The Royal Commission has urged the State Government to fast-track these Legislative changes, even though there are no current viable plans for any nuclear industry developments in S.A. at this time. Modification of the State Waste Dump Prohibition Laws. This Legislation was almost immediately amended following presentation of the Royal Commission’s findings, to allow Government spending on proposals for the Waste Dumps. The further question of approval of nuclear waste dumps in S.A. was put to the Labour State Conference and became a stalemate to which no decision could be made. Progress of changes to Legislation on this proposal was interrupted. Legislation that would allow contracts of Uranium sales to be tied to obligations on S.A. taking back the resultant waste. The Royal Commission sees this possibility as an enhancement to capture sales of Uranium, despite there being no approval for waste disposal in S. A. at this time, and, the fact that no such facility would be capable of fulfilling the contract until well into the future. The Royal Commission appears to be determined to place the people of S.A. into an intractable situation where industry is forcing obligation through contractual arrangements. However, a caveat might be placed on such contracts that are not plausible…an explicit caveat and the risk is borne by the signing parties. A letter of advice is provided to the signatory and the Annual AGM of companies involved informed of this unethical business practice. Legislative changes to allow Nuclear Power production. Despite there being no overt plans for these developments within the foreseeable future, the Royal Commission is encouraging making changes now for future development. The absence of a ready nuclear waste disposal dump has historically been a constraint on Australia and the world in the development of greater Nuclear ambitions. Reports of illegal dumping and covert placement of radioactive waste abound both here and across the world. Reports of French waste being held at Lucas Heights and American wasteat Pine Gap are recent additions to these claims.Despite peoples’ efforts over many generations to call for and act on Peaceful Principles in our World, Environmental Sustainability and Productivity based on Need rather than Greed, capitalism and its theory of perpetual growth continues to drive forward in an overtly destructive manner.The continued focus on South Australia to perpetuate the nuclear travesty on our planet is acknowledged through this Forum and collectively we stand against this invasion. We walk with the Protectors of Country with Respect for Life. THE Prime Minister’s senior ­indigenous adviser, Warren Mundine, plans to sue Fairfax after he was accused of brokering a “highly questionable deal” that gave a mining company ­access to an Aboriginal sacred site in Western Australia. “The allegations against me published in Fairfax Media last weekend are false,” Mr Mundine says in the statement to be ­released today. Legal advice questioned controversial mining deal: http://www.smh.com.au/national/legal-advice-questioned-controversial-mining-deal-20140715-ztbnd.html#ixzz37mgd7Zbq July 15, 2014 Richard Baker and Nick McKenzie More legal advice has emerged questioning the process that led to a controversial deal between a West Australian aboriginal corporation and a mining company. Fairfax Media has obtained advice from a third in-house lawyer for the Western Desert Lands Aboriginal Corporation which cast doubt over the process that lead to a deal with Reward Minerals to mine a Martu sacred site in outback WA called Lake Disappointment. At the weekend, Fairfax Media revealed how two other in-house lawyers for the Western Desert corporation wrote an explosive July, 2011 memo warning that a soon-to-be signed deal with Reward had “no validity”, in part because the corporation’s board and executives had, in their opinion, not acted in the best interests of the Martu people. A 2009 email reveals that a separate in-house lawyer for the corporation also raised concerns about the Martu people not having given “proper informed consent” to an in-principle agreement signed with Reward to mine Lake Disappointment a year earlier. In March, 2009, the Western Desert corporation’s then in-house lawyer, Christina Araujo, emailed acting chief executive Tony Wright to advise that she was not “prepared to state that I believe WDLAC has the informed consent of the common law holders” because it could put her practising certificate at risk. “Tony, further to our conversation on the 6th of March, I am confirming in writing concerns I have in relation to the Reward negotiations,” Ms Araujo wrote. “Apart from my personal observations, I have also had discussions with a number of others who were also of the view that proper informed consent is or may be lacking. “Going through the files, it appears Katherine Hill [another legal adviser], on numerous occasions provided advice on proper informed consent and it is noted in a file note dated 16/10/2007 that she spoke to Joe Procter and Clinton Wolf about her concern that people did not seem to understand there was a mining proposal over Lake Disappointment. Mr Procter was a consultant helping the Western Desert corporation negotiate the initial 2008 deal and Mr Wolf was then the corporation’s chief executive. Ms Araujo’s March, 2009 email came at the same time the Native Title Tribunal heard Martu elders testify about the cultural significance of the Lake Disappointment site. The tribunal was asked to rule on Reward’s proposal after relations between the mining company and the Western Desert corporation stalled in mid-2008 amid an argument over legal costs. In a historic ruling, the tribunal rejected Reward’s bid on the basis of Lake Disappointment’s cultural importance to the Martu people. It was the first time the tribunal had refused a mining company’s application. But, as reported by Fairfax Media at the weekend, the Western Desert corporation altered it stance on the Reward proposal in 2011, despite strong doubts from another set of in-house lawyers about the negotiation process not being conducted in the best interests of the Martu people. Ms Araujo’s successors as the Western Desert corporation’s in-house lawyers warned that the Reward negotiation process had in their opinion put the corporation in breach of most of its legal obligations as the trustee body for Martu people. In a January, 2011 announcement to the Australian Stock Exchange, Reward revealed it had in late 2010 approached the Western Desert corporation to re-open talks over Lake Disappointment. Company documents show at the time of this announcement that IIM’s shareholders and directors included former Western Desert chief executive Mr Wolf, senior Azure Capital executives and Warren Mundine, who was last year appointed as the federal government’s top indigenous adviser. Another shareholder at this time was the Western Desert corporation’s chief financial officer Mr Wright. Mr Mundine has confirmed that he was not personally involved in the negotiations nor benefited from the deal. Western Desert corporation chief executive Noel Whitehead and Mr Wolf said external legal advisers were engaged in 2011 to ensure the deal was done properly and fairly. Reward this week rejected any inference its negotiations over Lake Disappointment were unfair. It said independent legal and financial advisers were involved and great care had been taken to treat the Martu people with respect. Muckaty station nuclear waste dump will not go ahead: Aboriginal Traditional Owners succeed in legal challenge Maurice Blackburn statement, 19 June 2014 http://www.mauriceblackburn.com.au/about/media-centre/media-statements/2014/muckaty-station-nuclear-waste-dump-will-not-go-ahead-aboriginal-traditional-owners-succeed-in-legal-challenge/ Plans to build a nuclear waste dump on Aboriginal land at Muckaty Station near Tennant Creek will not go ahead after the Commonwealth agreed not to act upon the nomination of the site by the Northern Land Council (NLC). Leading social justice law firm Maurice Blackburn has been acting for Traditional Owners opposed to the dump in a four-year legal fight that was two weeks into a Federal Court trial when it was resolved. The parties plan to ask that Justice Anthony North of the Federal Court dismiss the proceedings, which were due to continue in Darwin next week. This settlement is without any admission of liability. “Aboriginal people at Muckaty have been fighting this plan for more than seven years and are overjoyed to have secured this outcome. The matter has been run by Maurice Blackburn on a pro bono basis. Barristers including Ron Merkel QC and David Yarrow have also acted pro bono. “Just like the class actions and other landmark cases brought by Maurice Blackburn, our pro bono cases provide access to justice and make a real difference in terms of public accountability”, Ms O’Shea said. “I feel ecstatic. I feel free because it was a long struggle to protect my land. I feel really happy about this decision because my children, grandchildren and great grandchildren can go to Namerini safely. This is what Australia is: it is a free land and Traditional Owners must always be free to express what they want done on their land. A fee simple estate in Muckaty Station was granted to the Muckaty Aboriginal Land Trust (MLT, a respondent to the proceeding) in 1999 following a claim under the Aboriginal Land Rights (Northern Territory) Act 1976 (Cth) (ALRA). The MLT holds Muckaty Station on trust under the ALRA for the benefit of the traditional Aboriginal owners of Muckaty Station and of other Aboriginal persons entitled to enter upon or use the land in accordance with Aboriginal tradition. The Northern Land Council (NLC, also a respondent) is a body established under ALRA to supervise and administer Aboriginal land trusts in respect of areas in the Northern Territory including Muckaty Station. The NLC is responsible under ALRA for giving lawful directions to and acting on behalf of the MLT for the benefit of the traditional Aboriginal owners of and the Aboriginal people holding an interest in Muckaty Station. In June 2007, the NLC purported to nominate a portion of Muckaty Station as a potential site for the management and storage of radioactive waste. Traditional Owners alleged in the action that the NLC failed to take appropriate steps to ensure the traditional Aboriginal owners understood the nature and purpose of the nomination, and failed to obtain proper consent before nominating the site. Legal proceedings against the Commonwealth and the NLC were commenced in June 2010. The Federal Court trial began on 2 June 2014. The Commonwealth Radioactive Waste Management Act (2005) states that even if an Aboriginal community or group that might be affected by the proposed nomination has not been consulted and does not consent, the nomination can go ahead. And even if Justice Anthony North rules that the NLC behaved improperly, the facility might still be built at Muckaty. 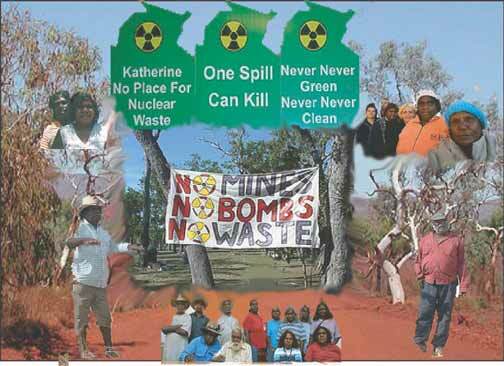 Nuclear waste dump may still go ahead https://au.news.yahoo.com/thewest/national/a/24233270/nuclear-waste-dump-may-still-go-ahead/ NEDA VANOVACJune 13, 2014, The news is always a little old at the Tennant Creek newsagency. It takes a while for the papers to be transported to the town, 1000km south of Darwin and about 500km north of Alice Springs in the rocky, semi-arid Barkly tablelands. At 283,648 square kilometres, the tablelands are one-fifth of the Northern Territory and bigger than New Zealand. However, even eight years after the battle over the proposed Muckaty waste dump began, this dispute is anything but old news. The Federal Court this week took evidence from locals in what many hope will be a long-awaited resolution to a situation that has split the town. In 2006, a small patch of land on Muckaty Station, 120km north of Tennant Creek, was put forward by the Northern Land Council (NLC) to the Commonwealth government to become Australia’s national radioactive waste storage facility. The council had the permission of the Lauder family of the Ngapa clan, which it determined were the rightful owners of that spot. However, seven clans lay claim to land within the 221,000ha station, and all have dreamings and songlines that overlap and intersect, meaning the court will have to untangle what it can to determine which group can claim to the roughly two square kilometres that would house the facility if it goes ahead. Beyond Nuclear initiative By Padraic Gibson 6 June 14Dr Donoghue continued submissions for the Commonwealth for most of the morning session. He restated an argument that both the Northern Land Council and Commonwealth have used in the lead up to this trial during Directions Hearings; that the Commonwealth Radioactive Waste Management Act (2005) had been clearly designed to shut down legal avenues for Aboriginal people wanting challenge the nomination of their land for a waste “facility”. Dr Donoghue explained that the Commonwealth had been attempting to establish a remote “facility” since the 1980s in numerous locations. But consistent opposition, including successful litigation, had prevented them from doing so. With this in mind, the Howard Government went out of it’s way to ensure Traditional Aboriginal Owners were explicitly stripped of their rights in the 2005 Act. Dr Donoghue cited a number of legal avenues explicitly closed to anyone wanting to challenge a national radioactive waste dump, including the exclusion of procedural fairness and a clause allowing nominations on Aboriginal land to remain valid even if a Land Council had not complied with obligations under the Aboriginal Land Rights Act (NT) 1976. If this argument is accepted by the court, the nomination of Muckaty as a nuclear waste dump will stand even if the Traditional Owners are found never to have consented to the nomination. Or, as Dr Donoghue put it, “the fact of consent being validly given is not legally relevant”. This line of argument, not to mention the Radioactive Waste Management Act itself, demonstrates the extreme contempt in which the Commonwealth holds the rights of Aboriginal people. Another attack on Land Rights contained in the Act also became clear in the course of the Commonwealth submissions. So far, arguments in court have focussed on whether the NLC followed proper process in nominating the particular site now earmarked for the waste dump. The quality of consultations with other Traditional Owners, said to hold responsibility for land on Muckaty that is required for transport of the radioactive materials, has also been discussed. But Dr Donoghue made it clear that if the nomination of the waste dump site is allowed to stand, Aboriginal owners of adjacent lands would lose any rights to stop developments on their land needed to facilitate the dump. The Act gives power to the Commonwealth to simply compulsorily acquire any further land that they need to allow the dump to operate……. Nuclear waste dump on Aboriginal land invalid, court told The West Australian, 3 June 14. Sydney (AFP) – The earmarking of a remote Australian outback area as a nuclear waste dump was invalid because officials failed to contact all traditional Aboriginal landowners affected, a court heard Monday.Muckaty Station in the Northern Territory was nominated in early 2007 as a site to store low and intermediate radioactive waste under a deal negotiated with the Aboriginal Ngapa clan. While Australia does not use nuclear power, it needs a site to store waste, including processed fuel rods from the country’s only nuclear reactor at Lucas Heights, on the outskirts of Sydney,…..Opponents have fought against the dump for years, with a trial starting in the Federal Court in Melbourne Monday alleging Muckaty’s nomination was invalid due to a failure of the government and the land council to obtain the consent of all Aboriginal owners. “What we’re here to say is ‘no more’ and that this process was so legally flawed that it is invalid,” Ron Merkel, who is representing traditional owners, told the court. “The opposition is in no small part based on a spiritual affiliation to the land and that radioactive waste will poison the land,” he said in comments cited by Australian Associated Press. The court was told the consent of all groups with a claim to the land was required for the facility to go ahead, but some Aboriginals whose country was affected have never had a chance to voice their concerns until now……..Speaking to reporters, Kylie Sambo, of the Warlmanpa people, said the idea of a waste facility on the land, which is in the centre of the country, was “poison”. The Australian Conservation Foundation said the case raised questions about the country’s management of long-lived radioactive waste. “Australia has never has an independent assessment of how best to manage radioactive waste; now we urgently need one,” campaigner Dave Sweeney said.